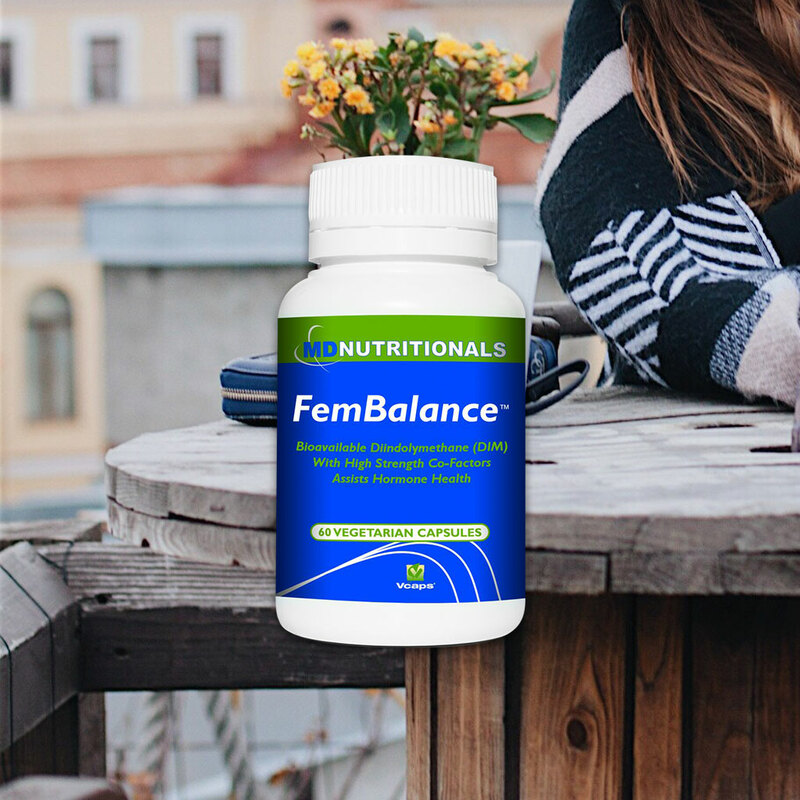 FemBalance® features Indolplex® plus Chaste berry (Vitex agnus castus), Bladderwrack (Fucus vesiculosus), selenium, and D3 to support healthy female hormone balance. FemBalance® is specially formulated to support female healthy hormonal balance. May reduce menstrual cycle irregularity, and reduce symptoms associated with pre-menstrual tension such as feelings of irritability, mood changes, and breast tenderness. Features Indolplex®, a proprietary microencapsulated formulation of 3, 3′-diindolylmethane (DIM) with high bioavailability. DIM is a natural plant indole that is abundant in cruciferous vegetables such as broccoli, Brussels sprouts, cauliflower, and cabbage. The critical role of hormones in breast, and prostate health has long been recognised. Bioavailable DIM modulates oestrogen metabolism, and alters urinary oestrogen metabolite profiles. Oestrogens are a group of three biochemically distinct hormones, oestradiol (E2), oestrone (E1), and oestriol (E3). Furthermore, oestrogen is enzymatically converted to specific oestrogen metabolites such as 16-alpha hydroxyoestrones, 2-methoxyestrogens, 16-alpha hydroxyoestrone, 4-hydroxyoestrogens and 4-methoxyoestrogens. Two oestrogen metabolites, 16-alpha hydroxyoestrone and 2-hydroxyoestrogen, have contrasting cellular activities. Chaste berry (Vitex agnus castus) is traditionally used in western herbal for a range of female reproductive conditions. May support healthy female reproductive hormone levels, and reduce symptoms associated with pre-menstrual tension. Bladderwrack is a natural source of iodine and traditional thyroid tonic to support thyroid gland health. Iodine assists thyroid hormone production, and plays a physiological role in supporting breast health. Supplies cholecalciferol (D3) to maintain levels within a normal range. Vitamin D3 has diverse effects in the body. This nutrient improves immunity, and supports calcium absorption to enhance bone health. Supplies selenium to increase levels in the body. Selenium is an antioxidant that enhances immune system function, and reduces free radicals formed in the body.